Ladies, you know how hard it is to store purses and handbags. Of course you're going to be bringing various purses to college with you. You're going to need handbags for your college notebooks to take to class, purses for daily use, and wristlets and purses for going out. With all these purses and handbags and minimal dorm room storage space, where are you going to store them all? Chances are you have them neatly organized and spread out at home, but when you get to college you don't have the same freedom because you don't have the same amount of space. You can let your purses hang out in a disorganized pile in the corner of your closet, but that would take up valuable dorm room storage space. When you're in college, every little bit counts for dorm room storage and dorm organization. 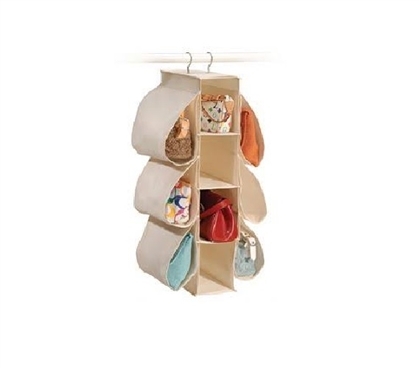 With our Hanging Purse Organizer, you can use just a little bit of horizontal space on your closet rod and take up vertical space instead to store your purses and handbags! Our Hanging Purse Organizer holds 10 purses and handbags, and can hold even more if you have small wristlets and dorm ID cases because those can all fit in one slot! Don't lose out on valuable dorm room storage space in your closet- stay organized by adding simple closet organizers! Holds purses and handbags up to 8" x 14"